Saforaia is a lucky girl. She just received the results for her annual school exam and is overjoyed. She wants to become a doctor and her excellent marks in chemistry, physics and biology will allow her to enter medical school. It may sound like an ordinary story, until you meet Saforaia and her fellow students. Saforaia is from Afghanistan. She can still remember her childhood under the Taliban, when girls over the age of 12 were forbidden to attend school and women were not allowed to work, forcing many teachers to go begging in the streets. After years of fear and constant threats of persecution Saforaia's parents had to move to a refugee camp in Pakistan, where the family has lived ever since. Saforaia would love to go back to Afghanistan. She dreams of life as a doctor in a rural area where the people are poor and illiterate. But for a girl receiving an education in Afghanistan is fraught with danger even today. The Taliban are on the rise in the countryside and the fundamentalists in parliament who control the capital Kabul are not much better. In July President Hamid Karzai's Cabinet approved the proposal to re-establish the infamous 'Department for the Promotion of Virtue and Prevention of Vice', the police force that under the Taliban flogged women in the street for not being covered from head to toe or for laughing out loud. According to the parliament's education committee insurgents have burned down 90 schools this year. In June a rocket hit a crowded school courtyard, killing six students. In January a headmaster was beheaded in front of his wife and children. In December a teacher was dragged out of his classroom and shot at the school gate. About 200 schools are now closed and parents are so afraid to send their daughters to school that according to UNICEF only five per cent of girls attend school. But Saforaia is a lucky girl. She lives in Khewa refugee camp in Pakistan and can attend Naseema Shaheed High School, a school operated by RAWA, the Revolutionary Association of the Women of Afghanistan. RAWA is one of the most amazing political and social organisations that exist today. Established in 1977, it is based on the principle that the liberation of Afghanistan's women can only come from the women themselves. It demands freedom, equality and human rights for women through the establishment of a secular Afghanistan that guarantees freedom of religion and tolerance of all ethnic groups. Although RAWA accepts only women as members it has many male supporters. In a country where it is still dangerous for a woman to go out of her house without being accompanied by a male relative, male supporters help RAWA activists to go about their daily tasks by pretending to be brothers or uncles, but they have no say in RAWA's decisions. In its nearly 30 years of existence RAWA has established orphanages, schools and hospitals for refugees in Pakistan and as far as possible in Afghanistan itself. It operated clandestine schools under the Taliban and continues to struggle against the religious fundamentalists who control the country today. Education takes a prominent place in RAWA's strategy for the liberation of women. An educated woman will not accept that being kept in the house like a slave, sold into marriage to a much older man and abandoned in divorce at the whim of the moment is the natural condition of women. Schools are therefore a central element of RAWA's liberation policy. 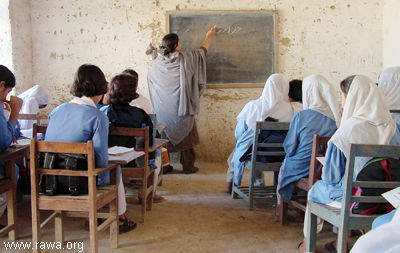 Their curriculum is based on RAWA's teaching values: respect for all human beings regardless of language, religion, race or colour; religious, ethnic and gender tolerance; care for the environment; rejection of violence; respect for family, partnership and freedom values and safeguard of individual rights. Education takes a prominent place in RAWA's strategy for the liberation of women. An educated woman will not accept that being kept in the house like a slave, sold into marriage to a much older man and abandoned in divorce at the whim of the moment is the natural condition of women. This is my eleventh year that I teach Chemistry for classes 12 and 11, and it has been the best part of my life working with RAWA and teaching in this school. I joined this school in 1995 when Khewa camp was heavily crowded. It was unbelievable for me to see such a massive gathering of women and girls with democratic ideas. As you would find women locked in the confines of their houses, not only in Afghanistan where the Taliban were in power but even in the nearby refugee camps, Khewa camp was definitely a beacon and a hub for all Afghan intellectuals. To satisfy the entry requirements for Kabul University, Islamic studies are also included in the lesson plan of the school; but far from preaching jihad and proffering fundamentalist indoctrination, religious instruction reinforces the principles of tolerance and non-violence. The funding of Naseema Shaheed High School and RAWA's other social activities relies entirely on the efforts of RAWA supporters around the world. SAWA-Australia, the Australia-based Support Association for the Women of Afghanistan, has pledged to raise sufficient funds to cover the entire school budget. The success of SAWA's fundraising efforts will determine whether Saforaia will be a village doctor one day or spend her life locked away in a house, depressed by the memories of an education she could not complete. We had big financial problems in the past three years, which badly affected our plans and standards. In order to effectively utilise the little budget we were receiving, we reduced our staff members, and some experienced teacher left the school. Our Physics and Chemistry labs were in a very bad condition because we didn't buy any equipment or medical for the labs in the past few years. Teachers were complaining that they couldn't perform the practicals. Now we have got hold of the many issues. With the donation from SAWA and extra money from RAWA, we could manage to minimise our problems to a very low level. We have now a full strength of staff members and reshape our laboratories to a good standard. If sufficient Australians pledge regular donations the future of Naseema Shaheed High School can be secured and Saforaia can complete her secondary education and move on to university. Note: Names have been changed to protect teachers and students. Matthias Tomczak is the National Convenor for SAWA Australia.